This is an Animal package consisting of World of Animals, Pets 2 Collect, Animals and You, Littlest Pet Shop, and Animal Friends. Please note we can tailor bespoke packages where you can personally choose from a selection of over 3,000 magazines! Buy this primary school magazine package or browse our other packages. World of Animals is for anyone with a love of wildlife dedicated to the world’s most beautiful and interesting wildlife. This fact-packed magazine also features breath-taking photography, stories, educational illustrations allowing the reader to visit all corners of the globe to discover the habits, behaviours and secrets of all their favourite animals. Pets 2 Collect is for all animal mad children, packed with all types of animals from furry friends, family pets to crazy creatures. 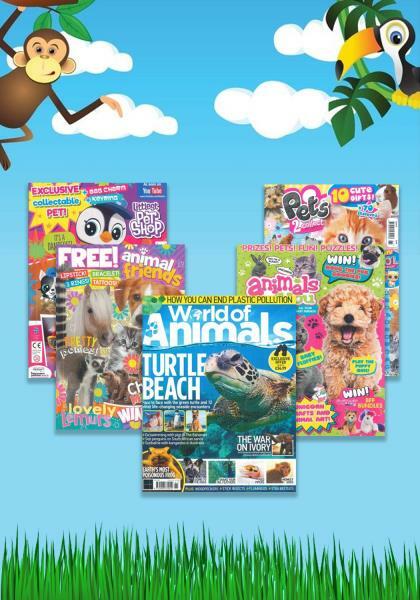 Find fabulous stories, puzzles, games, competitions, adorable posters, plus lots of features on pet care, showing readers how to look after their pets in an enjoyable, responsible and approachable way. Animals and You is for anyone who is animal and pet crazy packed full of quizzes, facts, games, competitions, stories and more. Bursting with all the information you need to understand animals in an entertaining way. Littlest Pet Shop is a very fun publication based on the hit TV show bringing Blythe and her pet friends’ stories to life through the power of print. following Blythe and all her pet-shop friends, the magazine is filled with fashion, comics, makes, quizzes, posters and competitions. Animal Friends features animals from the farm, zoo and home! Each issue takes children through the wonderful journey of animals, helping their abilities grow along whilst keeping them amused.